In the 1960’s I spent a total of two years on Macquarie Island, first as Auroral Physicist employed by the Antarctic Division and later as a postgraduate student. I visited the island again in the 1970’s during resupply trips. It was a rainy, windswept place teeming with wildlife – several species of penguin, fur seals and elephant seals, skuas, giant petrels and other sea birds all within the environs of the main base at Buckles Bay at the northern end of the island. Further afield, various sorts of albatross nested. The wandering albatross nesting on the coastal plain could be approached without attempting flight. They are the world’s largest flying bird, so large that they can only become airborne with difficulty. 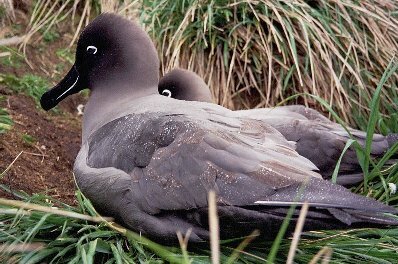 Another albatross, the incredibly beautiful, light-mantled sooty albatross, nested among the giant grass tussocks which completely covered the steep slopes. Occasionally, on the plateau, among cushion plants and rocks, a feral cat would be glimpsed from afar. They were larger than domestic cats and generally ginger in colour. On the coastal plains of grass and featherbed bog were rabbits and wekas. The Stewart Island weka is a flightless rail similar to the kiwi and introduced by the sealers. The wekas were amusing little creatures like fluffy, chestnut brown bantams. They occupied small territories with fiercely contested, but imaginary, boundary lines. On the beaches and around the base were piles of smelly, rotting kelp and numerous fat elephant seals either moulting, mating or fighting depending on the time of the year. It was like living in a zoo. Much of this has changed. The changes began with the extermination of the feral cats between 1985 and 2000 in an attempt to restore the island and its bird population to its pristine state. This led to an explosion in the rabbit population once this predator had been removed. Attempts to control the rabbits started as early as 1968 but with little success. It now appears that it was primarily the cats keeping them in check. The rabbits have devastated the island. The formerly copious tussock grasses which consolidated the steep slopes have been almost entirely denuded. This has resulted in a loss of habitat for nesting birds and an increased number of landslides. As a consequence, ten species of seabirds are now considered threatened. More recently, in the last two years, extensive dieback of the cushion plant, Azorela, has been observed throughout the plateau region. These things add up to an ecological disaster comparable with the introduction of the cane toad or prickly pear in an earlier era. This futile attempt to manage a subantarctic ecosystem has been an unmitigated disaster. There has been no apology, nor even acknowledgement from those involved. Instead current environmental problems are either blamed on the sealers of two centuries ago or on the shortcomings of funding arrangements. On 1 September 2012 the ABC Science Show broadcast a program “Macquarie Island: ecological progress with challenges ahead” which can be downloaded from the ABC web site. The program begins: Macquarie Island is the only land found between Australia and Antarctica. It is a haven for wildlife. Soon after discovery in 1810 it was exploited. Fur seals were butchered for their pelts, and within just 10 years they were wiped out. The foreign visitors introduced rabbits, rodents, mice and new plants which quickly took over from the native flora. This ecological disaster prompted the Australian federal and state governments to implement a Pest Eradication Project in 2011 targeting the introduced pests in a massive aerial baiting operation. Now the project is bearing fruit. Matthew Crawford visits Macquarie Island and finds a land almost devoid of animal pests, but still in critical need of help from invasive weeds, and a mystery response of some native plants which are experiencing dieback. Rabbits, to an extent, were controlled by the myxoma virus but the effectiveness gradually declined. The population really exploded in the last ten or so years before a one-off hit of calicivirus and the big aerial baiting operation last year. Also interviewed on the island was Dana Bergstrom, Principal Research Scientist, Australian Antarctic Division. In 2009 Bergstrom was lead author of a paper in the Journal of Applied Ecology: Indirect effects of invasive species removal devastate World Heritage Island. Using a combination of population data from of an invasive herbivore, plot-scale vegetation analyses, and satellite imagery, we show how a management intervention to eradicate a mesopredator has inadvertently and rapidly precipitated landscape-wide change on sub-Antarctic Macquarie Island. This happened despite the eradication being positioned within an integrated pest management framework. Following eradication of cats Felis catus in 2001, rabbit Oryctolagus cuniculus numbers increased substantially although a control action was in place (Myxoma virus), resulting in island-wide ecosystem effects. In other words, the rabbit plague, which has so far cost $25 million to fix, was a direct consequence of the removal of feral cats from Macquarie Island. This was well known to at least one of the people interviewed. It was neither mentioned nor even hinted at in the course of the 50 minute program. Why not? What is going on here? It is hard to believe that Project Manager, Springer, was not aware of this paper. If so his statements about the failure of myxoma virus, which had been trialed unsuccessfully for decades, are disingenuous to say the least. Climate change is a recurring theme, the subtext of this whole exercise despite the fact that there has been a met station on Macquarie since 1949 with accurate and comprehensive records showing negligible variation in the climate of the island over this interval. It did not prevent the rabbit explosion being attributed to this cause prior to the Bergstrom et al paper. And to be honest we haven't got any solid leads at this stage. We do think that it's exacerbated by a change in climate on the island, we think that's definitely got something to do with it, and whether that's interacting with the changing climate, it's interacting with pathogens, or there are other interactions at play, we're still trying to work out the detail, but there's definitely something going on that isn't good for the Azorella on Macquarie Island. Perhaps the aerial broadcasting of hundreds of tons (yes hundreds of tons) of a very nasty rat poison called brodifacoum as part of the baiting program could be a factor. Or is that particular explanation off-limits? Did anyone bother to research the possible effects of aerial baiting on the flora of the island? This radio program was misleading and dishonest and amounted to, quite literally, propaganda for the Antarctic Division and the Tasmanian Parks and Wildlife Service. We have one government agency, the ABC, participating in the cover-up of a massive blunder perpetrated by other government agencies. But there are deeper issues. The Macquarie Island rabbit holocaust is a good test case because it represents a microcosm of how things work on a larger scale, of how science is corrupted by the environmental movement. There are issues concerning the way science and scientists are perceived by the public and by themselves. Why is it assumed that science always gets it right, that industry alone is capable of wrecking the environment? There are issues about the unholy alliance between environmental scientists on the government payroll and environmental activists and lobby groups acting politically. There are issues about the way in which scientists manufacture environmental “threats” to extract money from government so as to keep themselves well funded. Sometime back in the late 20th century a decision was made to restore Macquarie Island to a condition similar to that which prevailed prior to the arrival of human beings in 1804. As I recall, this decision was arrived at slowly over many decades. It was always seen as desirable to remove or cull the introduced species. We also needed to ask whether it was possible, how it should have been done, whether it could have unintended consequences and what it would cost. I don’t think anyone really asked those questions. The desirability or otherwise is not a scientific question; it is a value judgment, one about which an informed layman has just as much right to an opinion as a scientist or other expert. Scientists do not own Macquarie Island even though they use it as their private ecological sandpit. When I was there the island appeared to be in a relatively stable state. Fur seals were coming back and their numbers were steadily building. Dove prions nesting in burrows were a worry because rabbits competed for burrows and cats took the chicks. There was concern that rabbits and cats were a problem for such native birds. What no-one seemed to notice was that the rabbits and cats had been at it for nearly two centuries. Any species threatened with extinction would have already disappeared. The island had arrived at a new stable ecology, albeit one involving introduced species. Was it possible to remove all the introduced species? Many of New Zealand’s offshore islands had been restored to ecological health chiefly by removal of rats and these provided a benchmark. However Macquarie was a very different kettle of fish: three days’ sail from civilization and much bigger than any of the NZ islands. It was the largest island for which such a pest eradication program had ever been attempted. This fact alone should have sounded alarm bells. What is really hard to understand is how this program came to be so badly implemented. Prior to their removal it was well known that rabbits provided the main diet for feral cats and that they had few other predators. Given the well known propensity of rabbits to breed, well, like rabbits, you don’t need a PhD in ecology to work out that removal of the cats could lead to a population explosion. Nevertheless a study was carried out and a report written recommending that the cats be exterminated. I have been unable to obtain a copy of this report even from the author; it seems to have been airbrushed out of the literature. What rankles most is the extermination of the wekas. They were feisty little creatures with loads of character. Certainly they were introduced but were they really a threat? If so, how? I suppose that report has been lost as well. And why does introduced always mean bad? There seems to be a puritanical impulse among environmental types to restore the world, or parts of it, to some imagined, stable, pre-industrial glory where every prospect pleases and only Man is vile. There is a life-hating, totalitarian streak about this head-set, a failure to accept the world as it is, warts and all. The ruthless extermination of Macquarie Island’s wekas, cats and rabbits in the name of Science sounds a lot like a Final Solution. A refutation of this article by Jeremy Smith can be found here. A response by the author can be found here.